Plus, Zlatan Ibrahimovic to be first goalscorer against Middlesbrough. 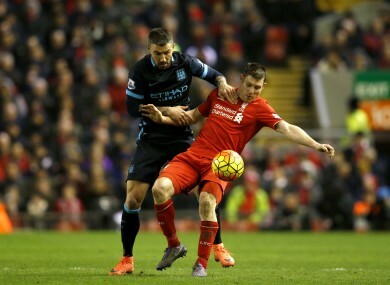 Liverpool's James Milner (right) and Manchester City's Aleksandar Kolarov battle for the ball during last season's match between the teams at Anfield. LIVERPOOL-MAN CITY is undoubtedly the big game of this weekend, with second taking on third in Saturday’s evening kick-off. The Reds are currently just one point ahead of Pep Guardiola’s side in the league, so expect it to be a closely-fought game. Liverpool’s home record should give them the edge, however. In their eight league games at Anfield so far this season, they have won six and drawn two. The games where they dropped points were against Man United and West Ham — Jose Mourinho’s team parked the bus in the former game, while Hammers stopper Darren Randolph made at least one inspired save in the latter. Unlike United, City generally always attack teams, and their defence has proved unreliable at times, while Liverpool — the highest scorers in the league with 45 goals — have the firepower to capitalise on their opponents’ weaknesses at the back. Moreover, the Etihad outfit’s away record this season is far from perfect — they have lost two out of nine games on their travels so far: against Tottenham and Leicester. At 35, Zlatan Ibrahimovic is showing no signs of fading. In 2016, he has 50 goals — one less than the highest scorer in Europe’s big five leagues, Barcelona superstar Lionel Messi. But while Messi has no games left in 2017, Ibrahimovic has a chance to overtake him if he scores twice against Middlesbrough on Saturday. A player as notoriously vain as the Swede is surely aware of this record and therefore will be particularly keen to get on target this weekend. In addition, with 11 goals in his last 10 games, the Man United star is on fire right now, and it seems conceivable that he could add to this tally while playing at Old Trafford against one of the Premier League’s weaker sides this weekend. Part of the reason for Tottenham’s inconsistent form since the start of the season has been the relatively underwhelming displays by England international Dele Alli. For much of the campaign, the 20-year-old midfielder has struggled to recapture the heady heights of a debut Premier League season that saw Alli inspire Spurs to mount an unlikely title challenge, which only dissipated in the final weeks of the campaign. However, the ex-MK Dons youngster, who scored 11 goals in all competitions last season, has shown signs of his old self lately. Against Southampton on Wednesday, he was the most influential player on the pitch, scoring his fifth and sixth goals of the campaign — a superb header to get Tottenham back in the game before rounding off the win with a composed finish. Consequently, both Spurs and Alli are starting to look back to their thrilling best, and expect Watford to suffer as a consequence in Sunday’s early match. Chelsea look simply unstoppable right now. On Monday, they secured their 12th consecutive league win amid a convincing 3-0 defeat of Bournemouth. 13th-placed Stoke have improved since their dismal start to the campaign, but have been outclassed on more than one occasion when up against the top sides — in clashes with Liverpool, Arsenal, Tottenham and Man City, they have lost 4-1, 3-1, 4-0 and 4-1. Furthermore, the Blues have destroyed better teams than Mark Hughes’ side this season, so expect a comfortable victory for Antonio Conte’s men at Stamford Bridge on Saturday. Leicester have been, without question, the most unpredictable Premier League team of the past three seasons, so placing a bet on them always feels brave to a degree. For instance, after an impressive 4-2 defeat of Man City earlier this month, some observers felt they were finally starting to rediscover the form that saw them win the Premier League in stunning fashion last season. Nevertheless, since then, they have picked up just one point from their last three matches and sit only three points above the relegation zone. Therefore, the prospect of the Foxes becoming the first-ever team to go down the season after winning the Premier League is no longer unthinkable. This weekend, Claudio Ranieri’s team come up against another side who have failed miserably to reach the heights of their previous campaign — Slaven Bilic’s West Ham. But what appears to give Leicester the edge in this fixture is their home form, which isn’t too bad — at the King Power Stadium since the start of the season, they have won four, drawn three and lost only two. In comparison, West Ham have a fairly underwhelming record on the road — winning two, drawing two and losing five. Email “Liverpool to overcome Man City and 4 more Premier League bets to consider”. Feedback on “Liverpool to overcome Man City and 4 more Premier League bets to consider”.